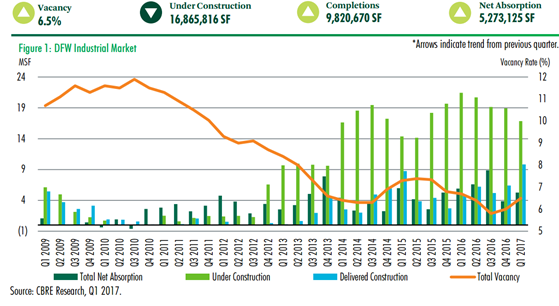 ​​​​​ DALLAS-FORT WORTH – CBRE has released its DFW Industrial MarketView First Quarter 2017 report. Industrial occupier demand in 1Q 2017 kept pace with 2016, as the DFW Industrial Market absorbed 5.3 million sf. First quarter 2017 was a quarterly record for new product delivery, when 9.8 million sf was delivered to market—a market record for deliveries in a single quarter. DFW market deliveries were 36.5 percent preleased. ​Check out more DFW Industrial Market Research.